Visitors looking for a great getaway with its own attractions close to Kruger Park will find Moholoholo Nature Reserve accommodation caters for all budgets. This Limpopo nature reserve accommodation has something for everyone with full board lodging, Bed & Breakfast as well as self-catering chalets to choose from. Guests can stay in a true nature getaway or enjoy accommodation with TV and swimming pool facilities. There are 3 options – Forest Camp, Ya Mati and Mountain View. Forest Camp at Moholoholo is set on the slopes of the majestic North Eastern Lowveld Drakensberg mountain range, hidden in a luscious rain forest. This inviting camp offers a warm welcome and country-style cooking for up to 20 people. Guests enjoy full board accommodation, a game drive, bush walk and a visit to the world renowned Wildlife Rehabilitation Centre. There are 10 secluded and well appointed thatched, log or reed chalets at Forest Camp. This Wildlife Rehabilitation Centre accommodation is an escape to nature and does not have a swimming pool, television, radios, telephones or any shopping facilities. There is a well stocked shop, filling station and bottle store nearby at Kampersrus. Each chalet at this Moholoholo Nature reserve accommodation is uniquely decorated and has en-suite facilities and ceiling fans in the bedrooms. The main building is where the dining room and deck are situated. The deck overlooks a small shady waterhole frequented by Samango Monkeys and many birds. The waterhole is floodlit at night and visited by nocturnal animals such as Bushpig, Civet and Porcupine. Scrumptious meals are served around a bush fire or on the thatched deck set high above the forest floor. All meals are served in buffet style (breakfast, lunch and dinner) and tea / coffee, rusks (biscuits for dunking) and cookies are available 24 hours a day. The Ya Mati accommodation at Moholoholo is situated on the banks of the Blyde River amongst lush trees and beautifully kept lawns. Ya Mati offers a variety of accommodation (self-catering and full board) and a lovely restaurant with tea garden. There is also an authentic chapel and a comprehensive selection of Bush Wedding packages with or without accommodation. These chalets at Moholoholo Nature Reserve and wildlife rehabilitation centre include 2 or 3 bathrooms, a fully equipped kitchen, private barbeque area on a wooden deck and a living room with a TV. 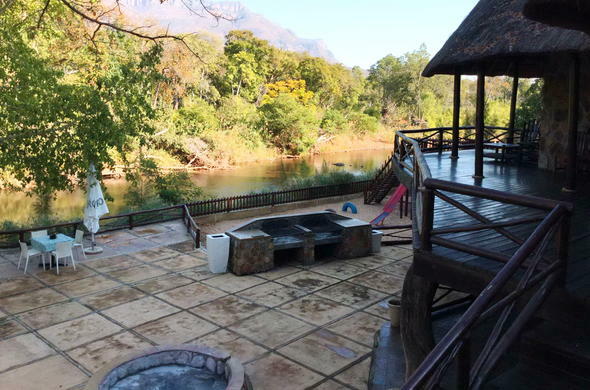 The 3 bedroom River Chalets include 2 bathrooms, a fully equipped kitchen, private barbeque area and swimming pool in the boma area (outdoor anclosure), living room with a TV and a separate deck which overlooks the Blyde River. The 2 Bed roomed self-catering chalet. Fully equipped kitchen with TV in living room, 2 bathrooms and a private braai area on wooden deck overlooking the Blyderiver. This 1 bedroom Chalet comes with with 2 single beds, small TV area with a coffee station and a bathroom with a toilet and shower. Ya Mati caters for the discerning caravanning enthusiast and provides a most unique Caravan Park with 11 exclusive sites carefully sculptured out of the bush. Each site is totally secluded from the rest and equipped with water, electricity and a private barbeque area. Moholoholo style thatched ablution facilities offer hot and cold water on tap. Breakfast and lunch are offered at Ya Mati`s unique tea garden at Moholoholo Wildlife Rehabilitation Centre and nature reserve (dinner on request). Mountain View accommodation at Moholoholo Nature Reserve is located in Lowveld Acacia Woodland and has become a preferred destination for nature enthusiasts, large School and Wildlife interest groups. Magical sunsets and refreshments can be enjoyed on the waterhole deck as the last rays are cast over the peaks of Moholoholo. The night skies are a delight for stargazers whilst sitting round a cheerful camp fire. There are three accommodation options available at Moholoholo: Stay at the Forest Camp, Ya Mati or Mountain View. Choose between standard or luxury chalets, a camp site and a honeymoon suite at Moholoholo Nature Reserve and Wildlife Rehabilitation Centre.